Some monuments in India never fade away, even if nature decides to wash them off. Shri Swaminarayan Temple in Bhuj, a Hindu temple located around 333 km from Ahmedabad, is one such marvel in Gujarat that was reconstructed after an earthquake that ruined the whole structure, except the idols. The temple was rebuilt with marble and gold, giving it a sheen of glory that you can't take your eyes from. The Swaminarayan Temple complex is located away from the buzz of the city, thus offers a serene environment to be with one's inner self. Let's take a virtual tour of the temple and find out more interesting details of this architectural wonder. The former temple was constructed by Swaminarayan, the founder of Swaminarayan Sampraday that is popular in Bhuj. 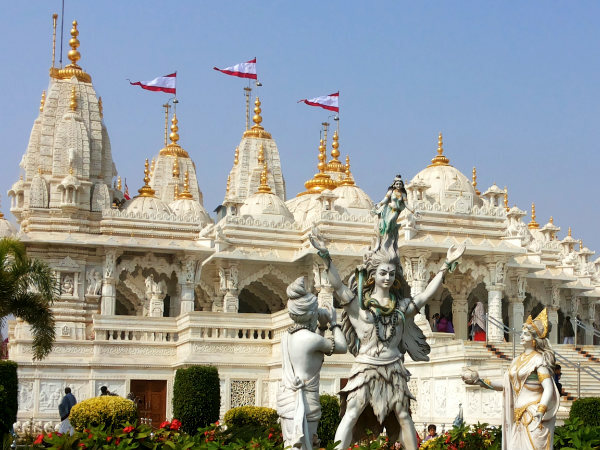 The new temple was built quite close to the old temple, and has various idols including that of Swaminarayan. The throne of Swaminarayan, the domes of the temple and its doors are made of gold, whereas the pillars and the ceilings are in marble. Though the earthquake in 2001 had ruined the city and the beautiful temple, the idols survived the catastrophe and the same ones were installed in the new temple. The temple complex is spread across 5 acres of land. The shimmering structure has 7 shikharas with a main dome, 25 smaller domes and 258 carved pillars made of pure marble. The temple also has idols of Radha Krishna, Ganesha and other divinities. Apart from the main temple, there are other attractions too. A temple has been constructed in the complex, exclusively for women. Sant Nivas is a meditation hall for the saints. Bhojan Hall allows more than 2000 persons to have food at a time. The devotees can sit and listen to the religious talks that happen through the day at Sabha Mandap. The temple is one of the most expensive temples built in Gujarat. Around 600 sculptors worked with the devotees for over 7 years to complete this project. It would be better to avoid the months of summer (March to May) as summers are severe in the city. The summers are followed by monsoon, which paves way to the winters in October. The months of winter (October to March) are ideal to visit the temple. The temple is open for its devotees from 6am to 7pm. The temple is easily accessible as Bhuj is well connected with other parts of Gujarat and the country. Trains, buses and even flights are available to reach the city.